It's a "BATMAN" time of the year! 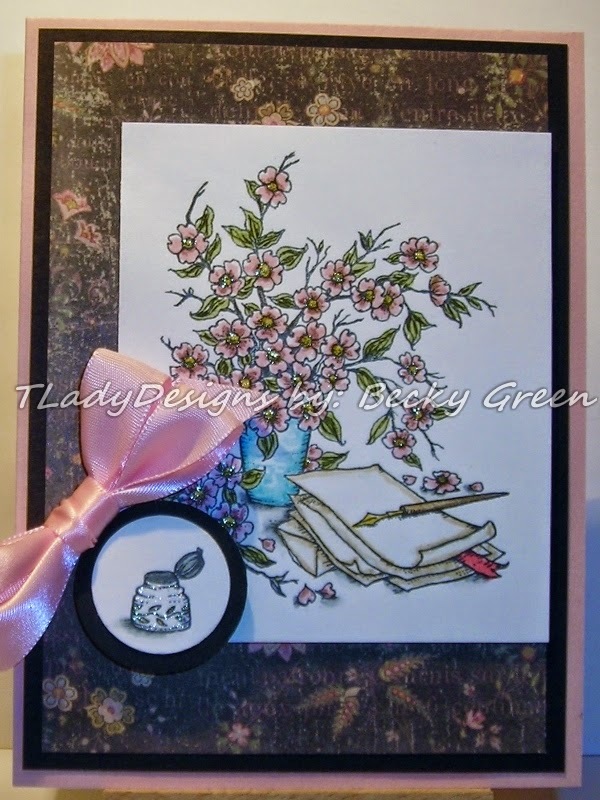 I'm here this week with a Birthday Card for you! 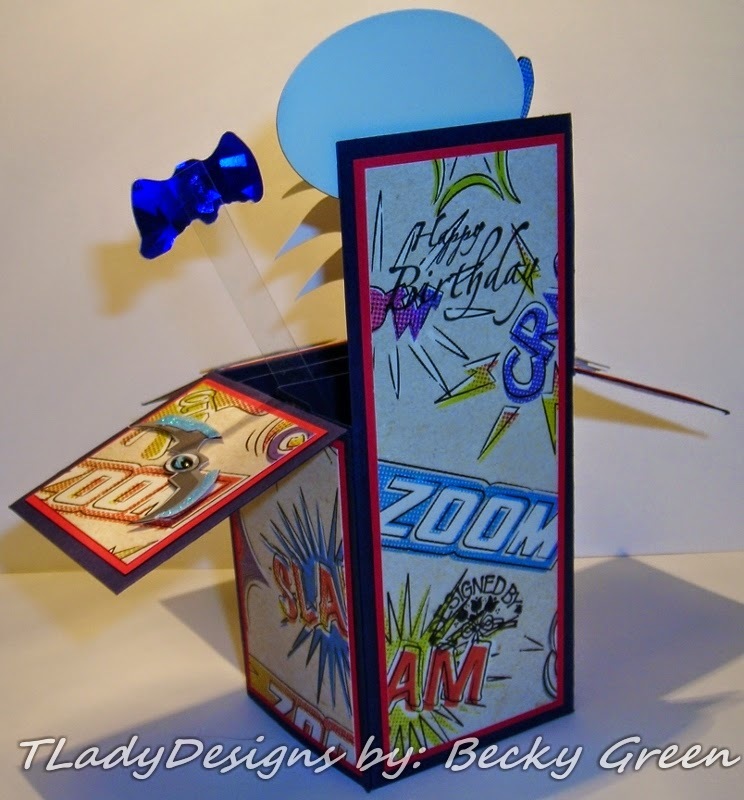 It was our son's Birthday recently & I thought you would like to see the card I made. Our daughter's gift to her brother was a Batman zippered hooded jacket which she gave him when he stayed the weekend on campus to visit his friends that were still there; they gave him a Batman party too. 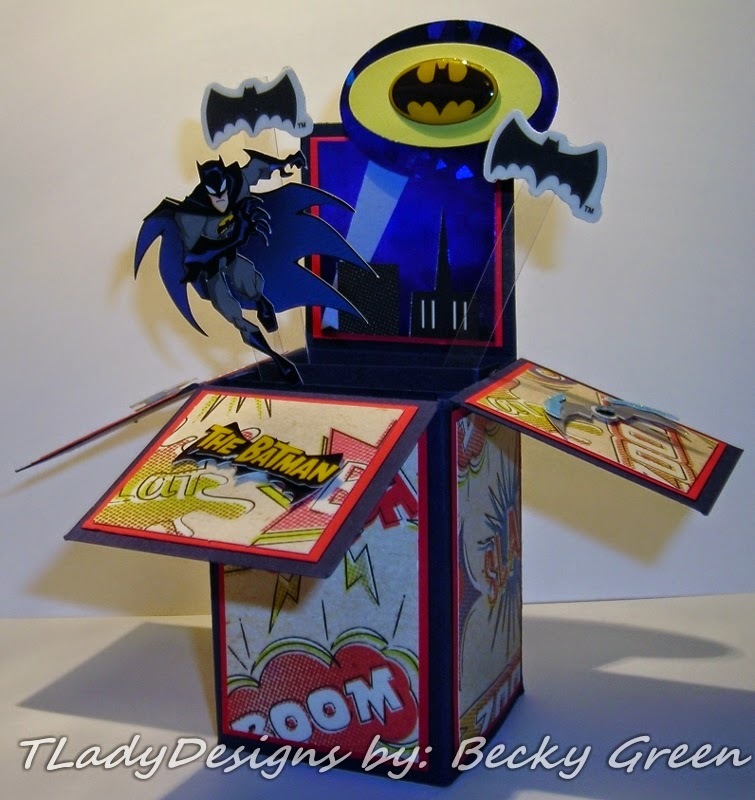 My husband picked up a Batman cake, & I made a Batman card! I think Batman is one of those things that seem to never be outgrown, at least here in our home! So, when Birthday time rolls around, it turns out, it's a "Batman" time of the year! 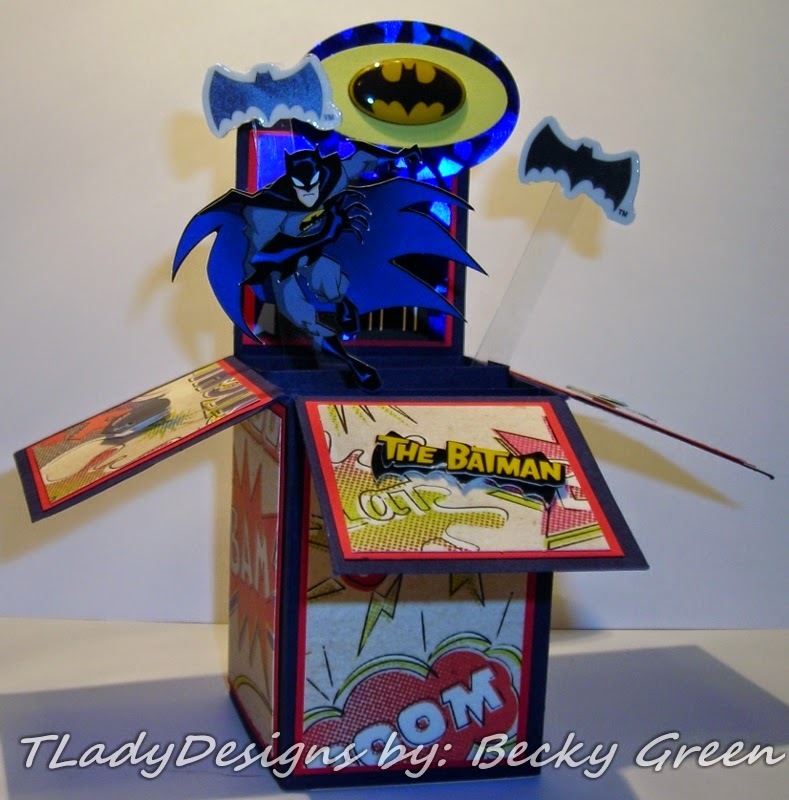 Our son likes "Inter-actional Cards" so of course, I had to make him a Pop-Up Box Card! 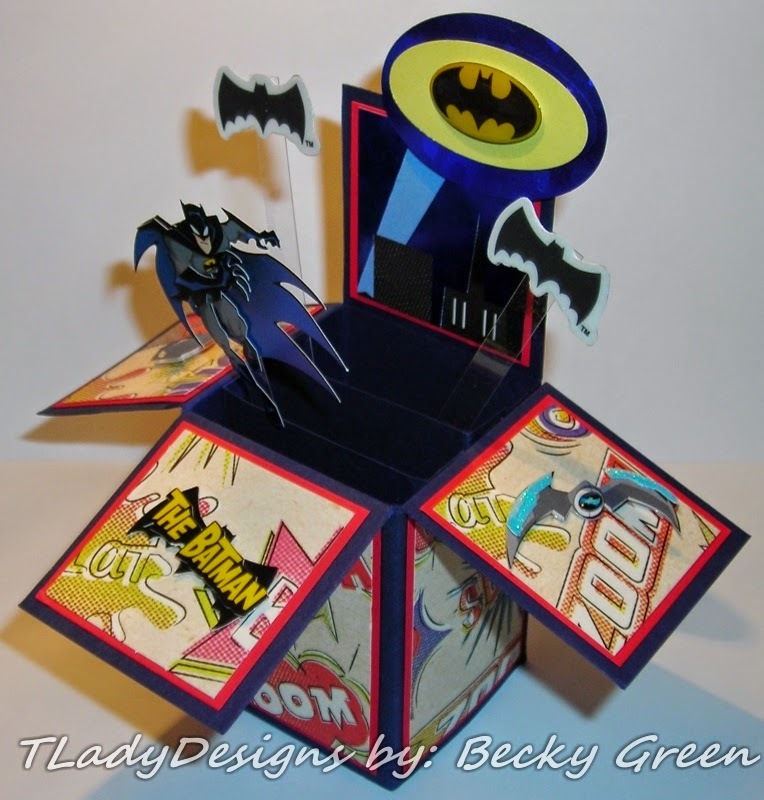 So, now you'll have a reference for a masculine Pop-Up Box Card too! I didn't fill the box card too full this time, trying to leave the background open so you can see it. & that is layered onto a SU- Large Oval Punch (blue). Can you see the buildings in the background & the beam? 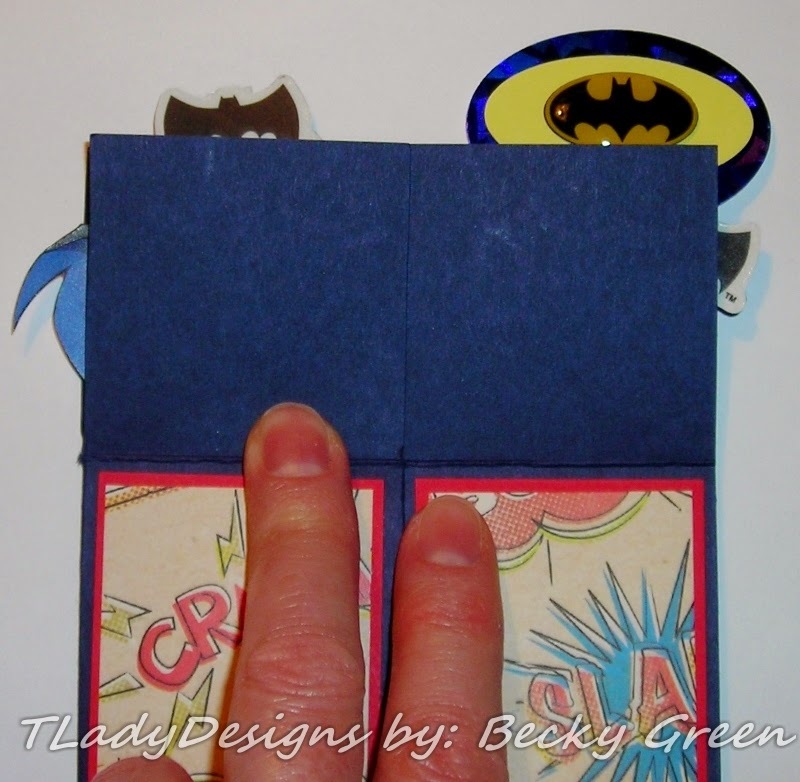 I used Recollections- Comic Hero's Designer Paper, found at Michael's. Batman himself, the Batman "signal," the Batman Mask, "The Batman," & a Boomerang! The bats are from another Batman Sticker set from Sandy Lion, also found at Hobby Lobby. 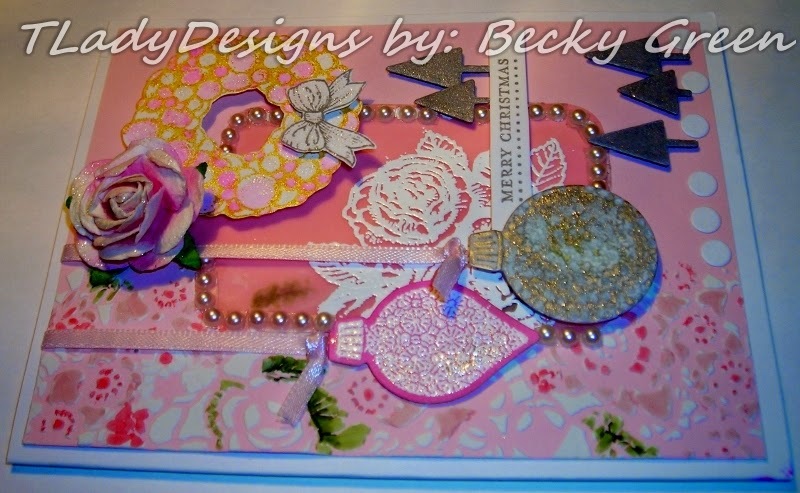 This is the back where I stamped "Happy Birthday!" I used SU- It's Your Birthday. (An old retired set. I never get rid of my Birthday sets---you need them all the time! 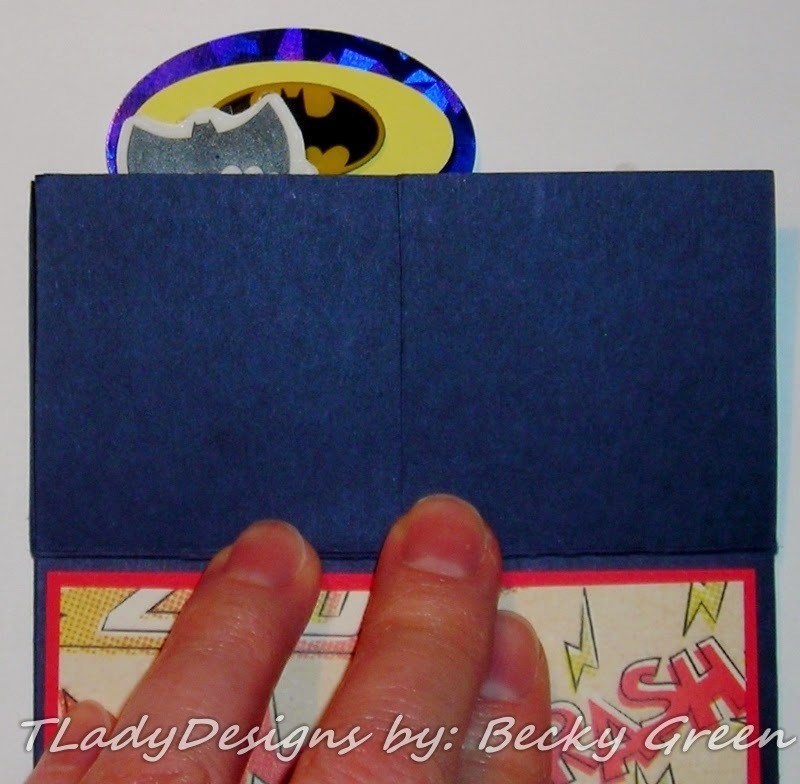 Because I used a Batman 3-D Sticker, I added the acetate strips to the back & where the sticker was still exposed, I added a 1/2" SU- Circle punch. 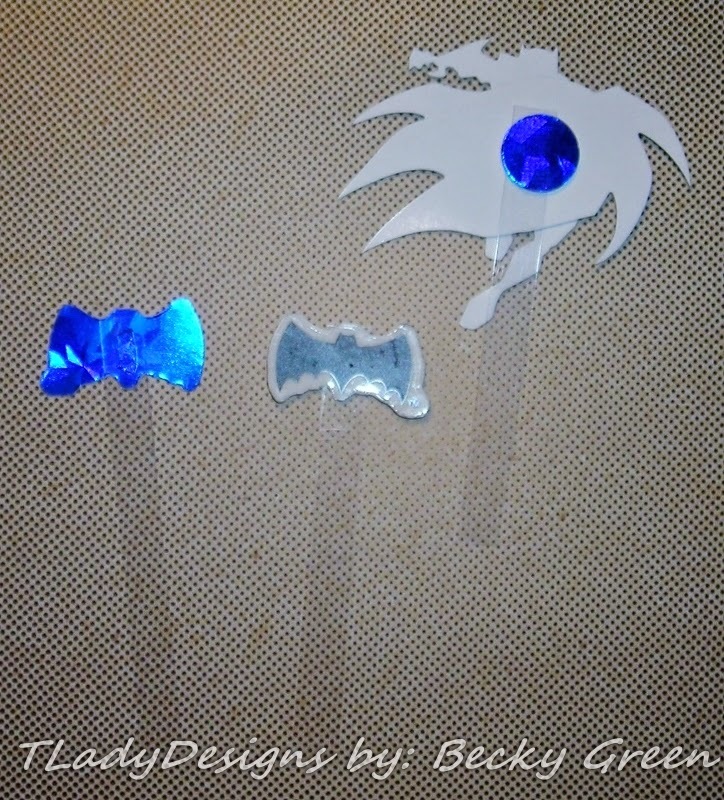 The Bat Stickers- I stuck them to designer paper & then cut them out attaching them to the acetate with glue dots. Her is my card laid flat on one side. Now, my Box Card folded to the other side. Only a small amount of Batman Goodness popping out... for maximum SURPRISE! 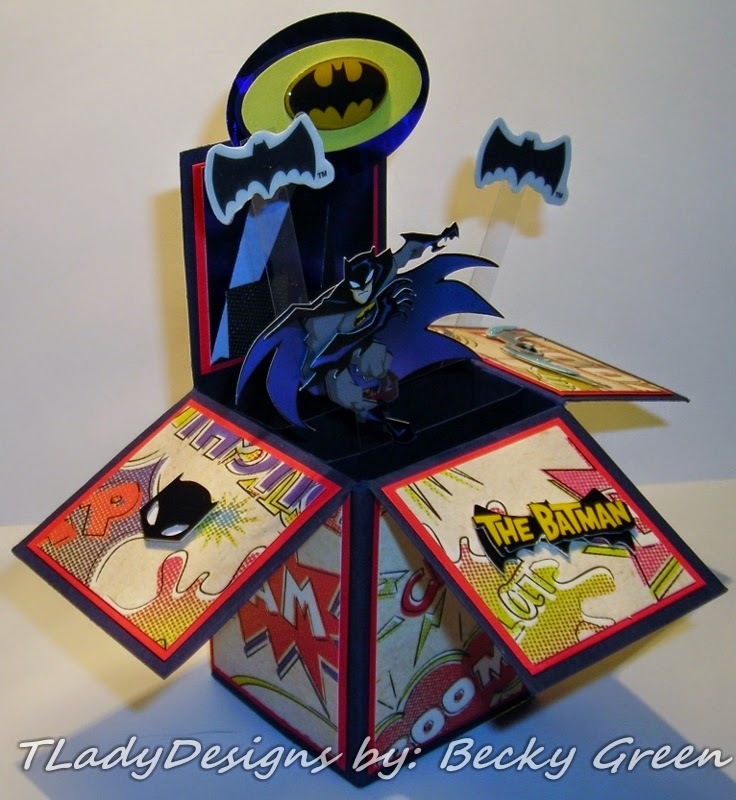 Hope you like my Batman Pop-Up Box Card! 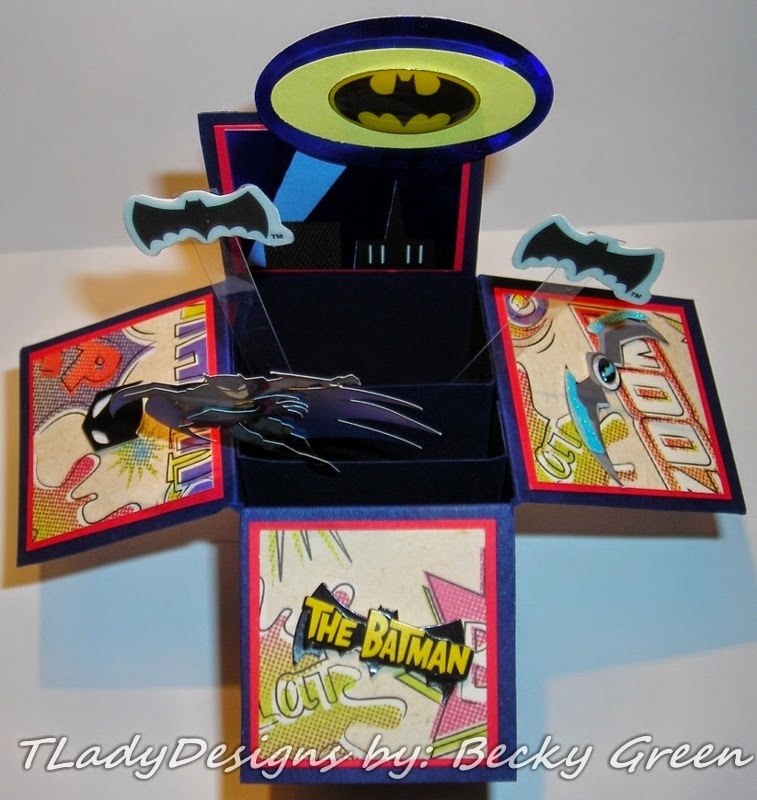 Batman is only a man in the story, a make-believe character, where God is Supernatural & REAL! I am SO GLAD our son knows that his #1 Super Hero is, The Lord! SURPRISE! 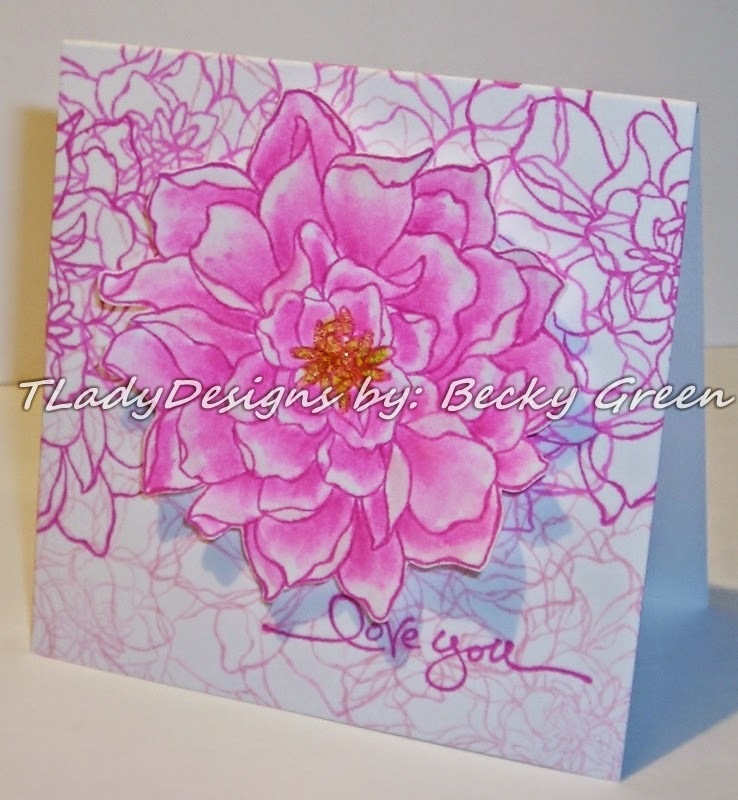 I thought I would go ahead & post a second card for you this week! I hope you enjoy! 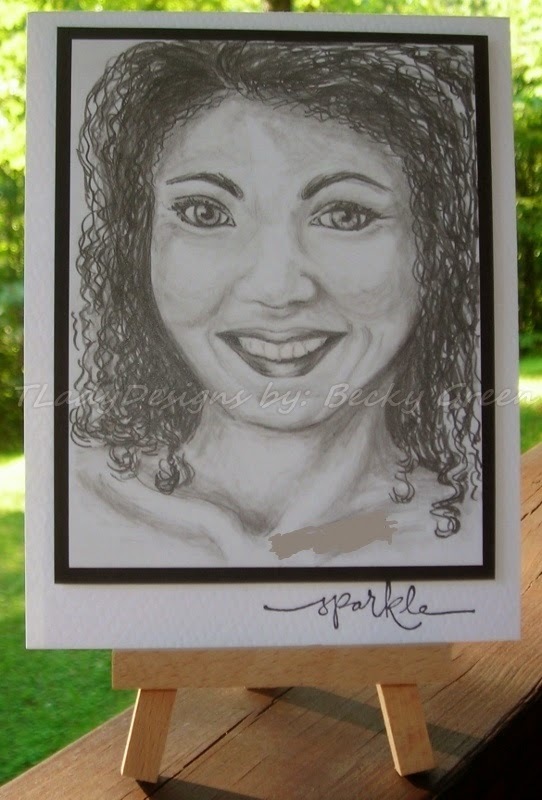 This card is for our daughter for this week while she is away at college. Because of the title of my post, I thought I should remind everyone to read their "love letters!" 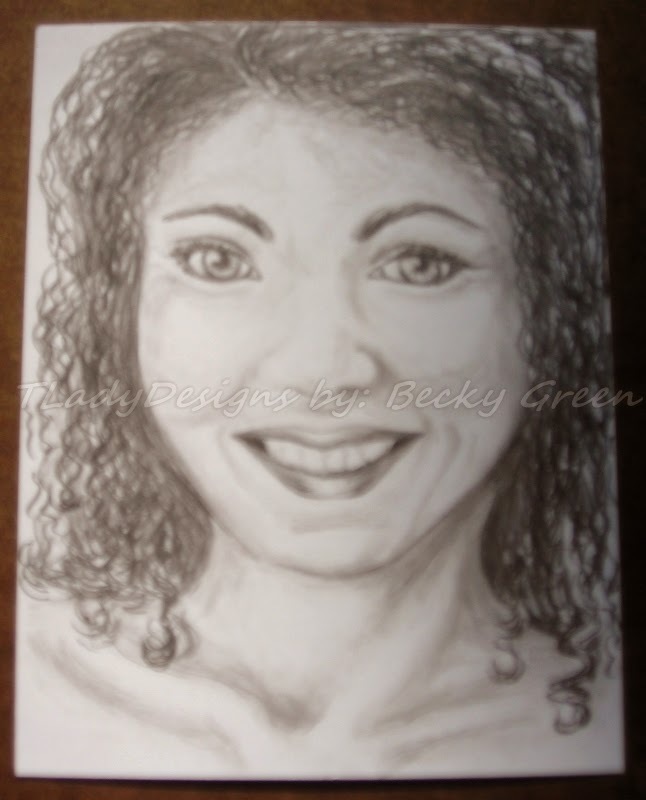 How would you feel if you wrote the one you love, a love letter & they never read it? I'm sure it would break your heart. Why wouldn't you read it? God has given us a love letter, His Holy Word, The Bible! I am happy that the Lord is always with us, we don't go anywhere without Him being right there with us! 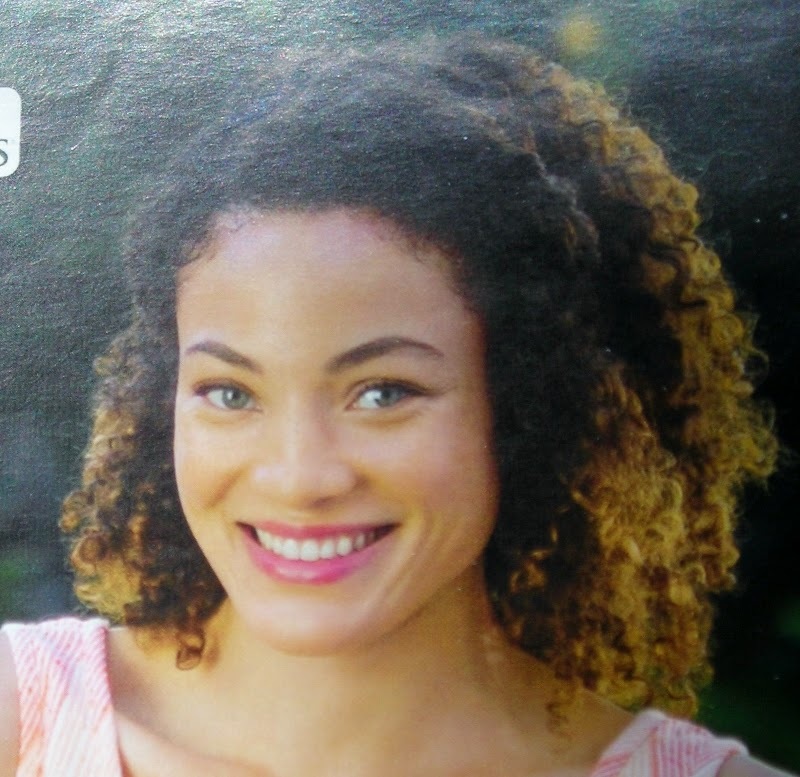 Loving us all the while. Even when we do things wrong. He just doesn't like our actions when we do those wrong things. He is always willing and able to forgive. 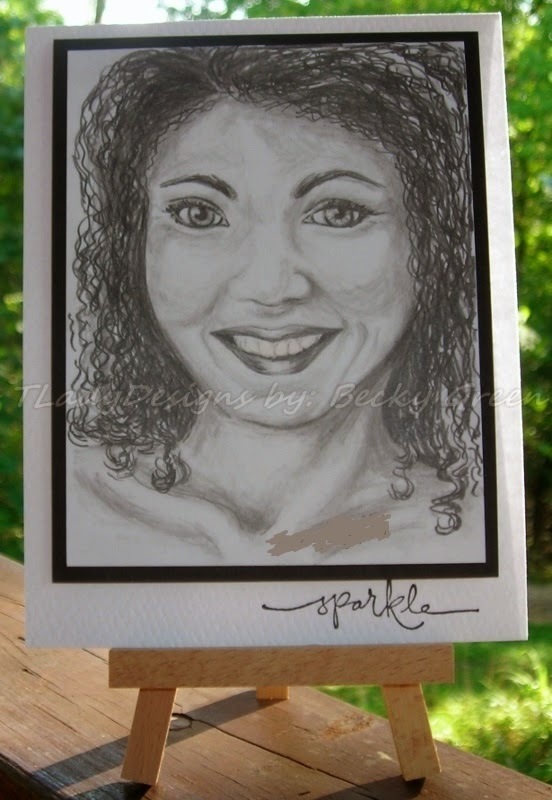 Do take some time today & spend some time reading your "love letter!" 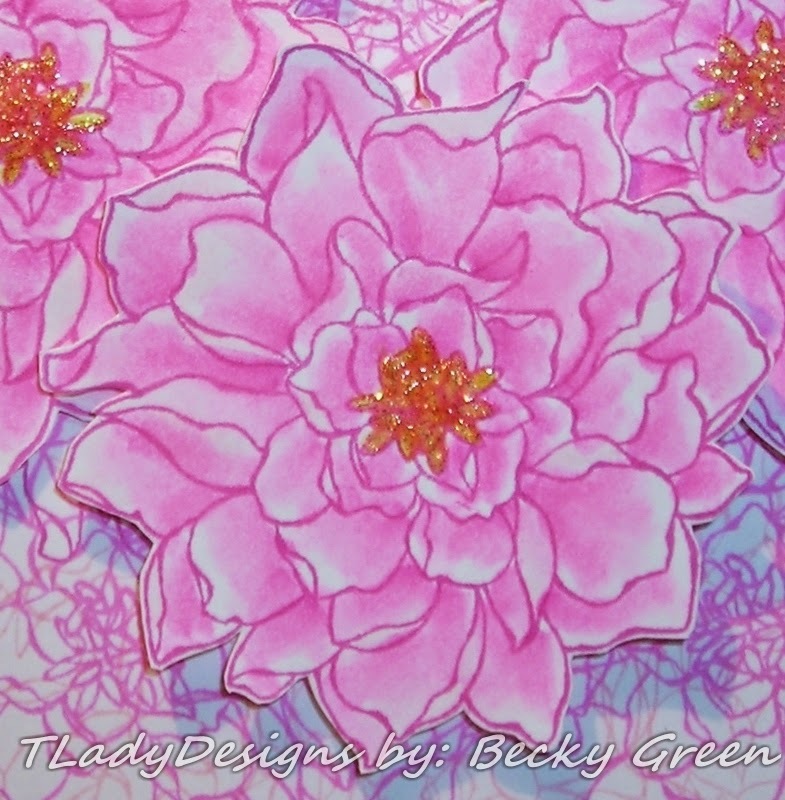 I used Flourishes- From the Desk of for my image. 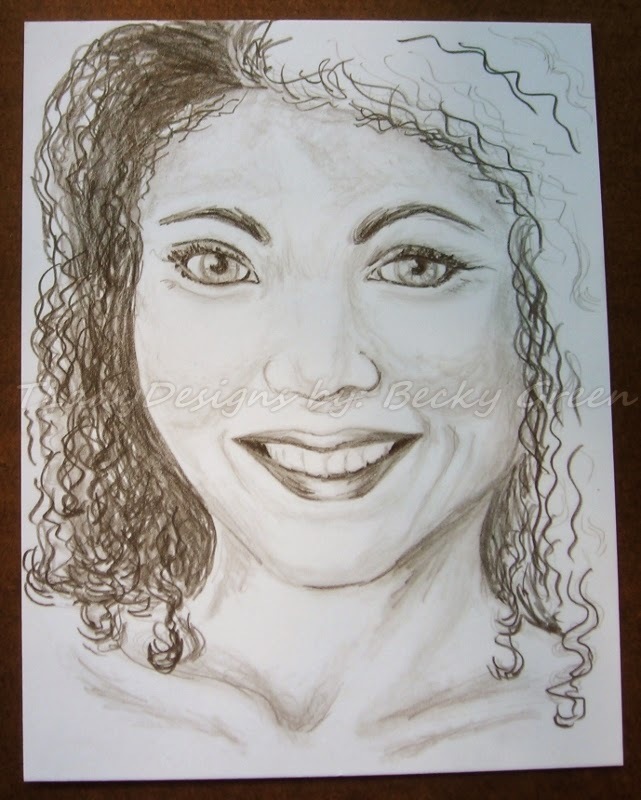 & blended some areas with a Letraset Watercolor Blender Pen. Paper Studio- Black, & SU- Blushing Bride. & I used SU- 1" & 1 1/4" Circle Punches. 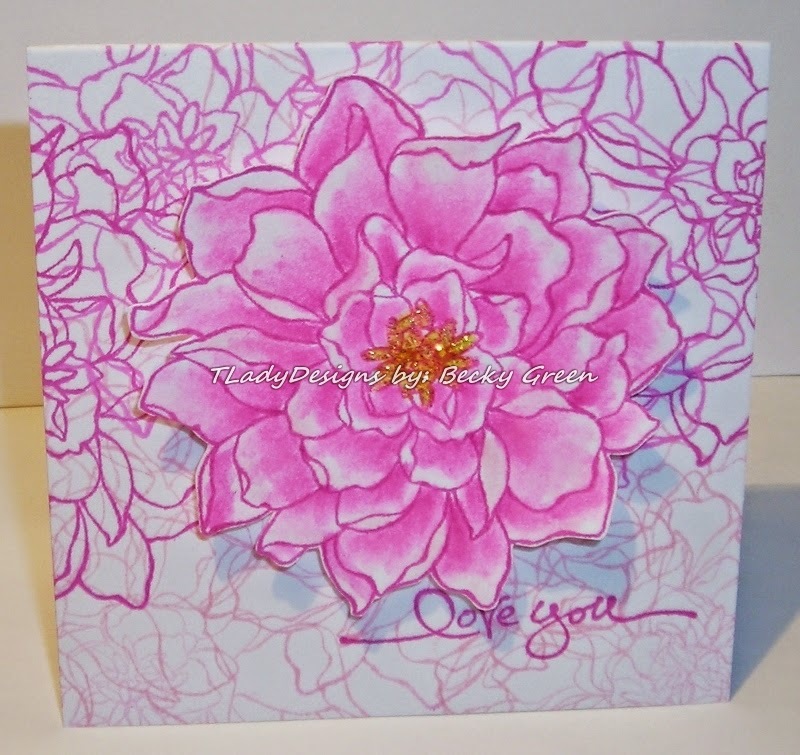 I also used Wink Of Stella for some sparkle on the centers of the flowers & on the ink well. This is the inside; from the same set- Flourishes- From the Desk of. The main image & the ink well are popped up on Scotch Perm. Mounting Tape. I think our daughter will like this one! 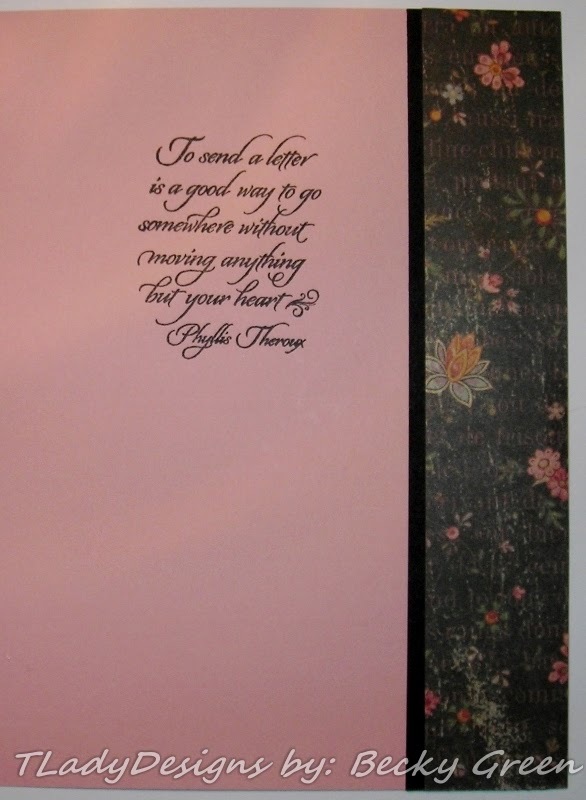 This reminds me, I do have some more love letters to write! A "Lovely Pink Christmas" & an UPDATE! I know I promised to tell you the direction of my blog this week, but plans have changed. I decided to do a challenge this week! It's been awhile, & I have many stamps that I haven't used yet---especially, Christmas Stamps! Isn't it PRETTY? All those babbles & shine & even FLOWERS! 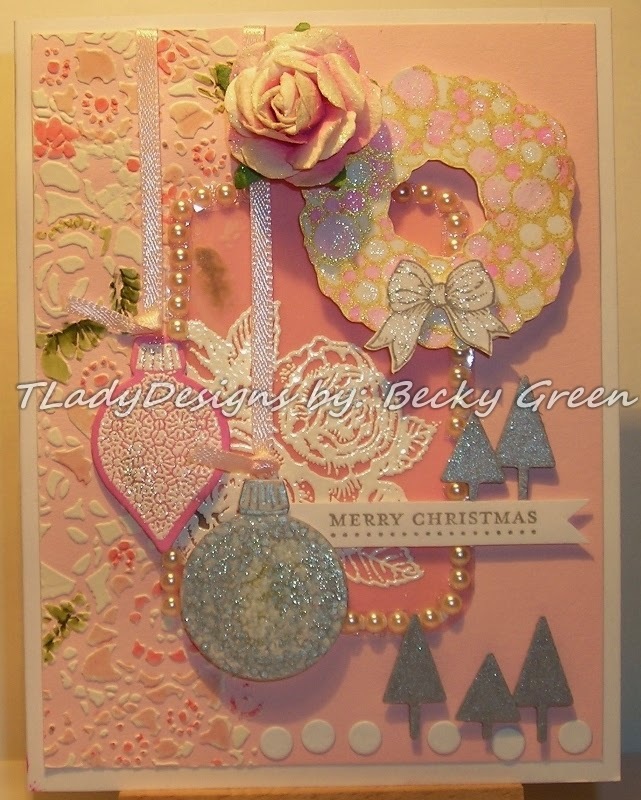 The other inspiration for my card is Melissa over at LilyBean Paperie, I LOVE her style! 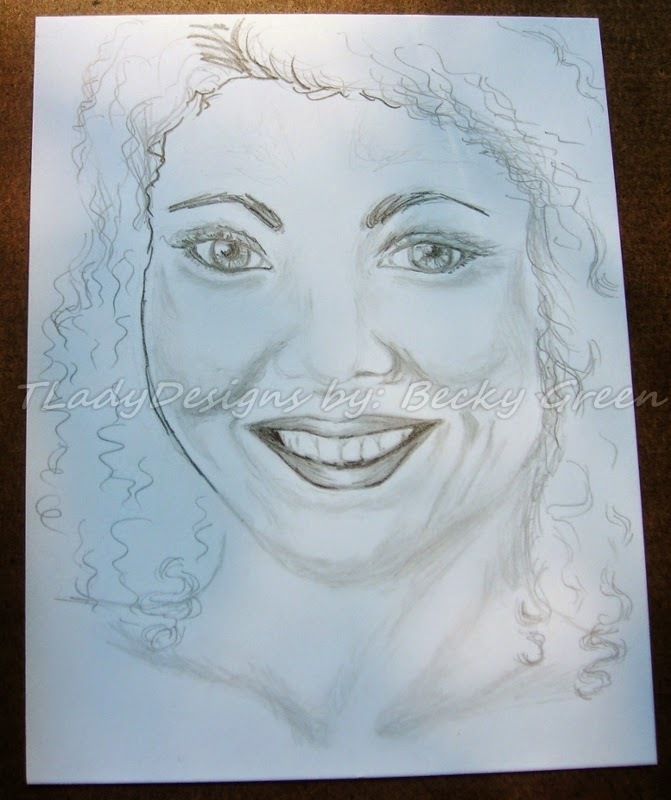 Melissa loves to use Vellum & just has a way with her lovely creations....sigh! 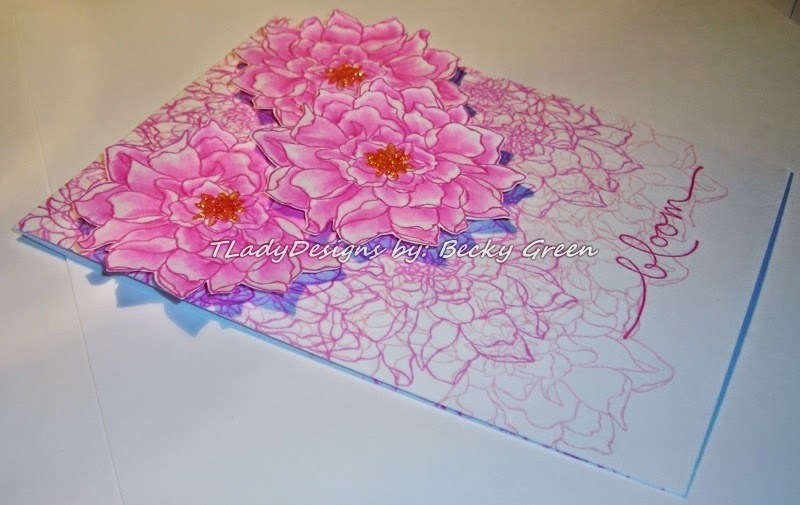 My card is 4 1/4" x 5 1/2". 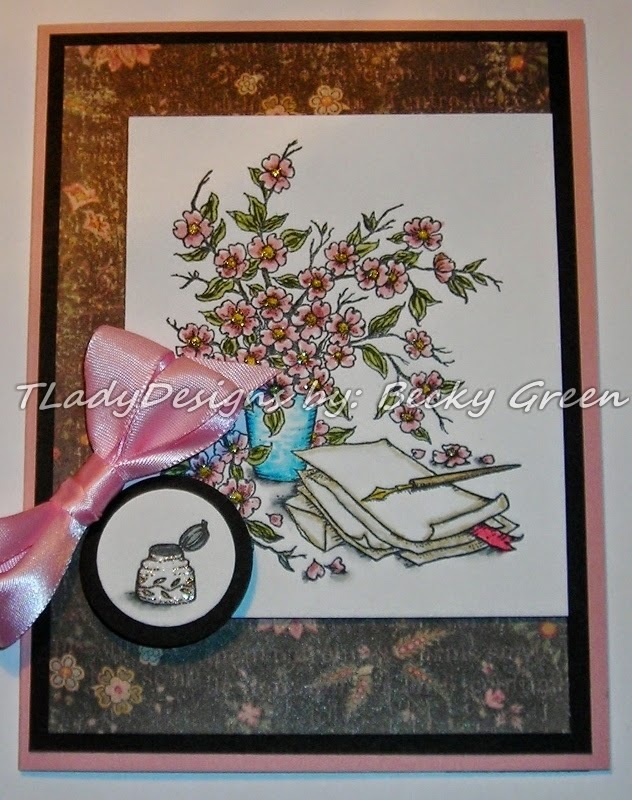 with a Tim Holtz- Doily Stencil. 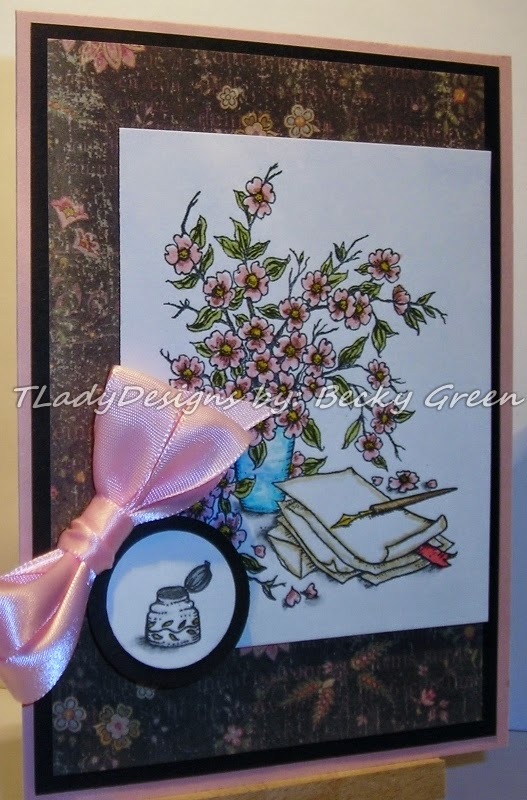 I also used Distress Markers to color the modeling paste here & there, to get the look of the floral curtain in the picture. I was quite pleased how it took the color. 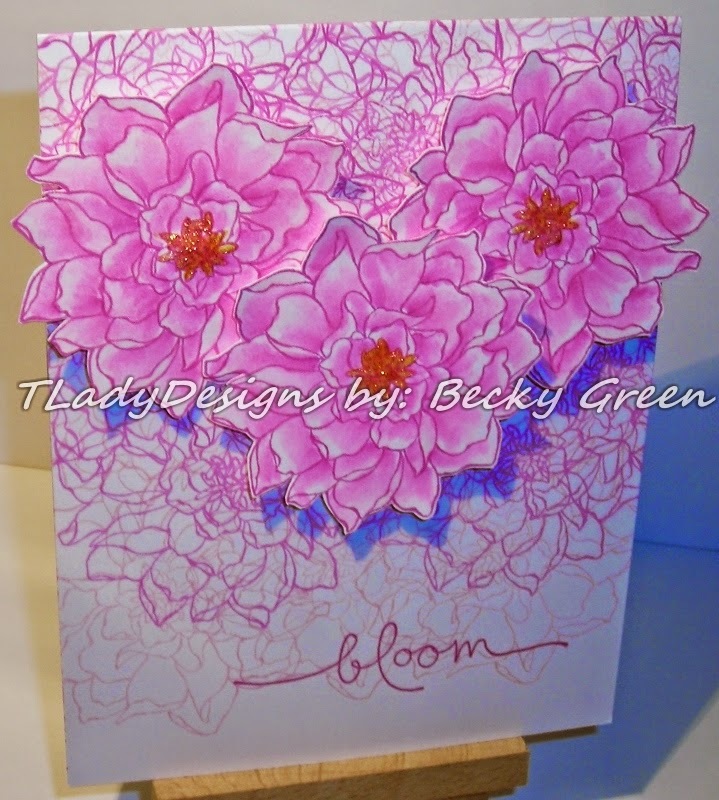 I used PTI- Tag Sale Die #1 & embossed it with Flourishes- A Year in Flowers 2, Versa Mark & Zig White Embossing Powder, & attached it with Vellum tape. & it is popped up on Scotch Perm. Mounting Tape. 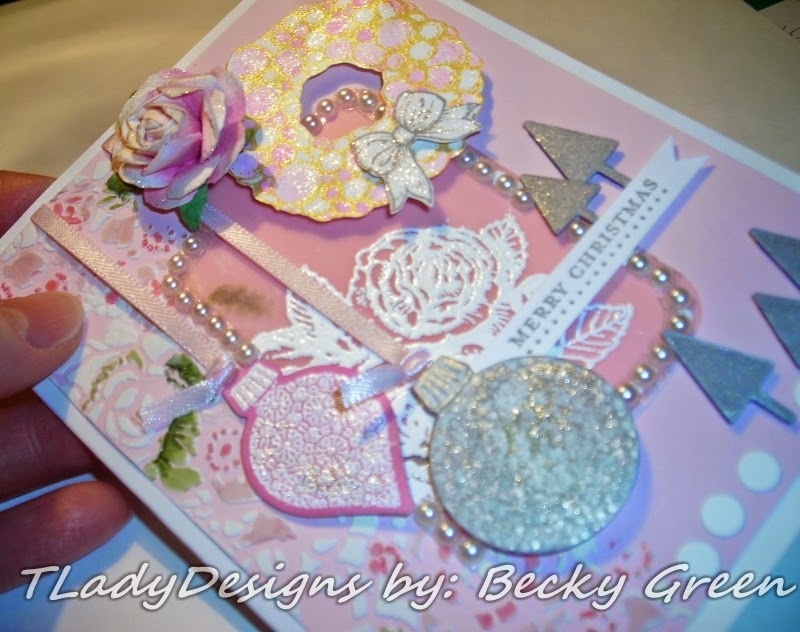 The Ornaments are by SU- Ornament Keepsakes Stamp Set & Dies. 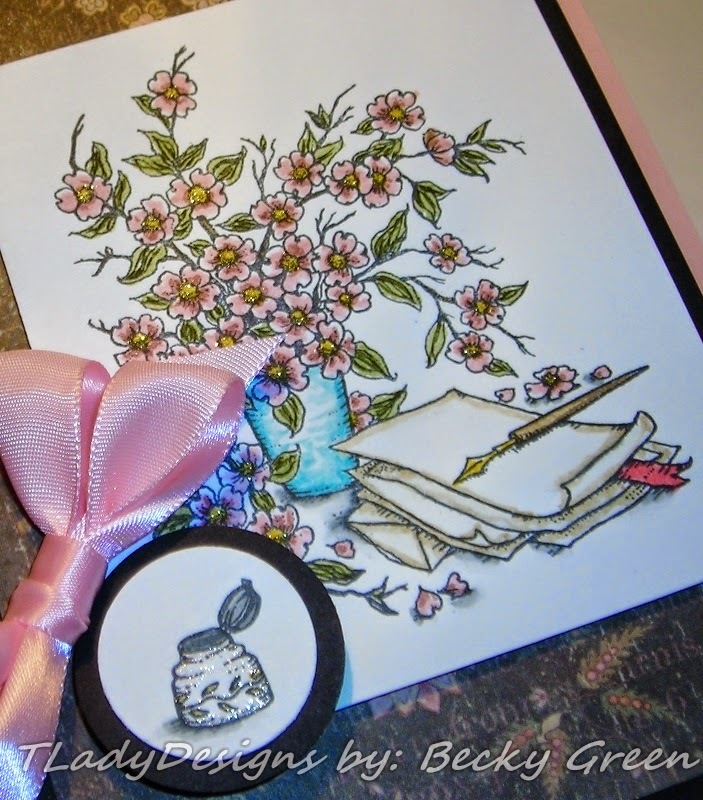 I embossed one with white embossing powder & sponged pink ink over it; the other I drew little circles over the die & added silver & white to the ball with Faber-Castell Pitt Pens- Silver 251*** & White 101***. The ornaments are popped up on Scotch Perm. Mounting Tape. The Christmas Wreath with bow is stamped with Brilliance Galaxy Gold Pigment Ink. 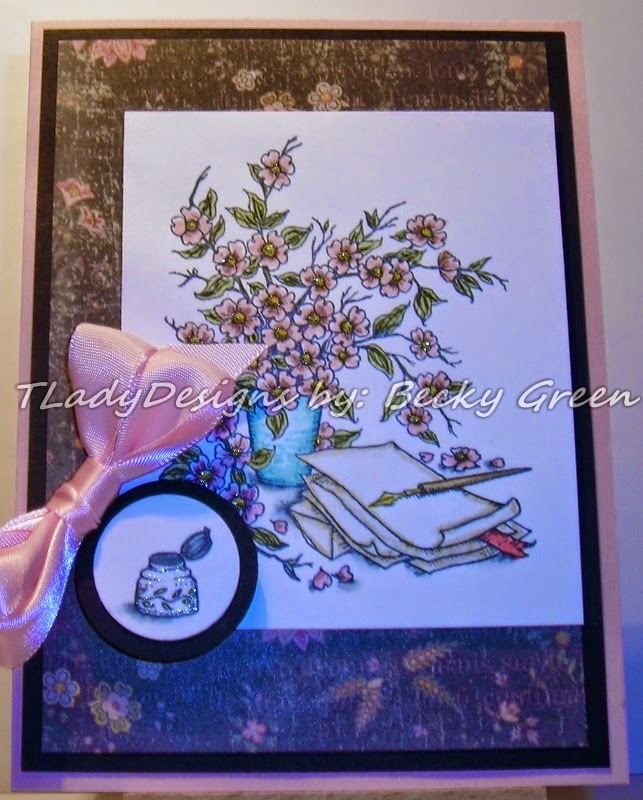 The Wreath & bow are from Flourishes- Seasons of Wreaths & I used a water color brush to add just a little pink color to some of the balls. The wreath is popped up on Scotch Perm. Mounting Tape also. & popped up on Scotch Mounting Tape. 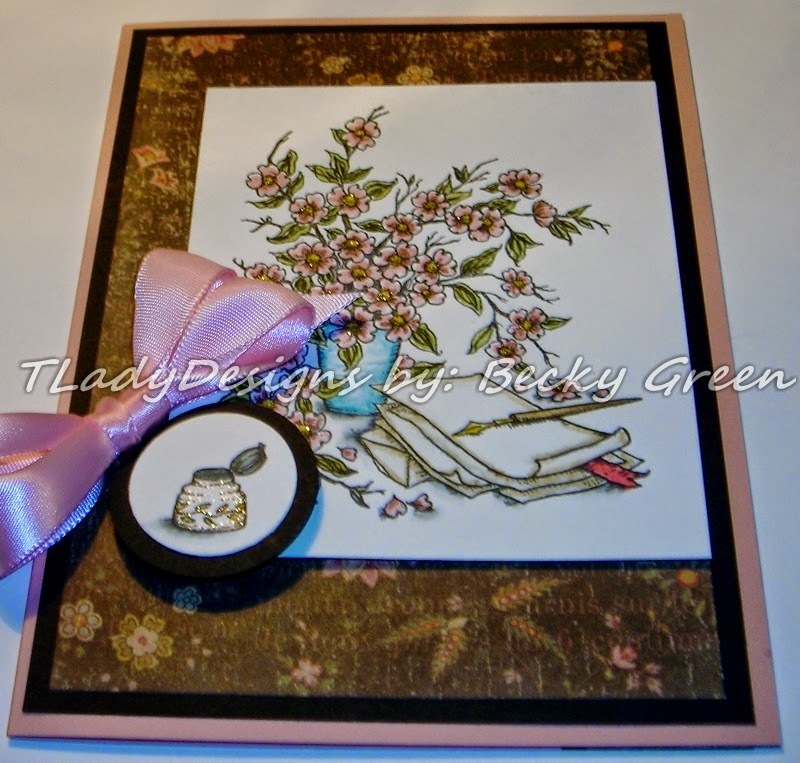 I used Paper Studio Pearls for edging the tag, and I added a Prima Flower to top it off. 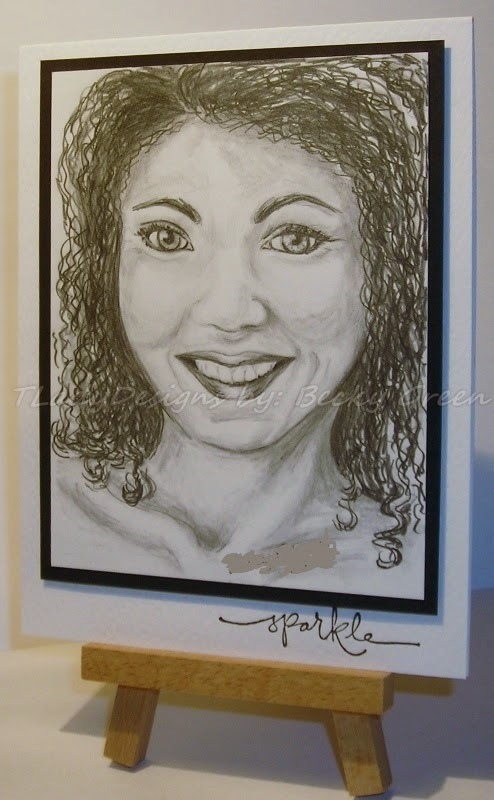 Here you can see all the sparkle....I used Wink of Stella, adding it to almost everything! A new product I'm trying, I LOVE IT! I even added it to the silver trees. Another look! I thought this picture showed a little more of the color & detail. 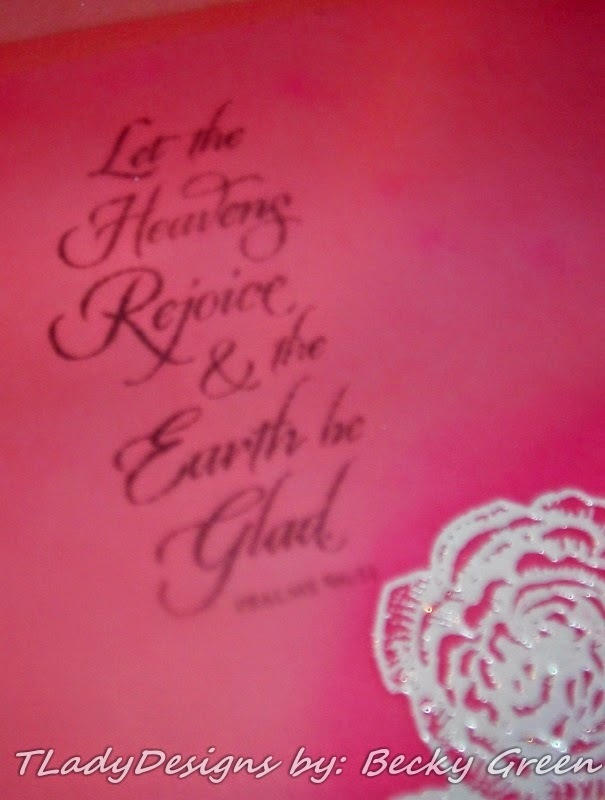 "Let the Heavens rejoice & the earth be glad." Psalm 96:11. 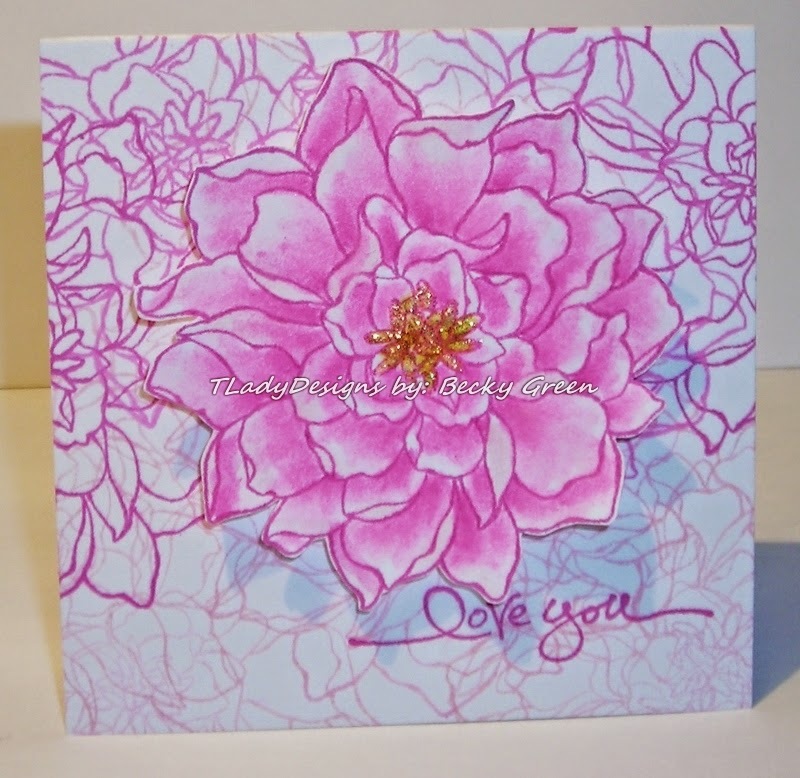 The inside sentiment is from Flourishes- Poinsettia & Pine. 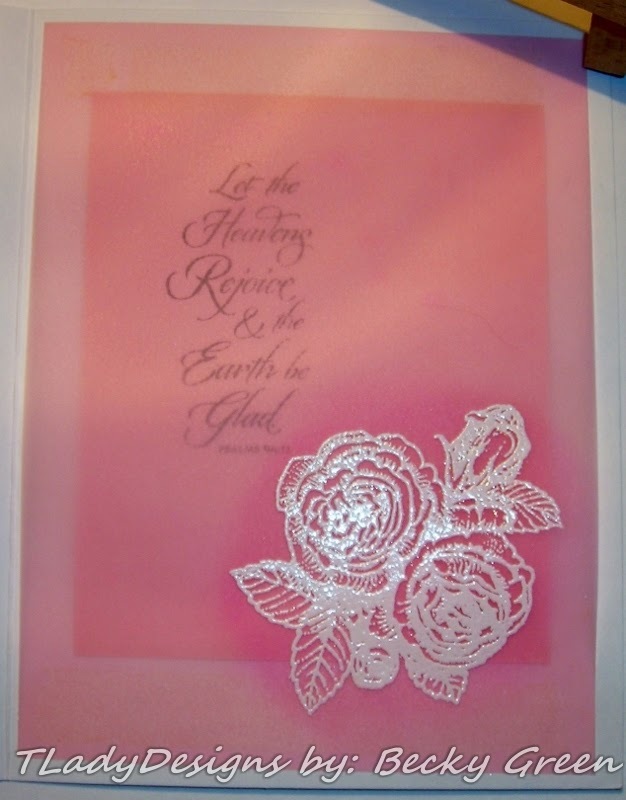 I just layered my Vellum over the sentiment & I sponged pink over the embossed rose, from Flourishes-A Year In Flowers 2. 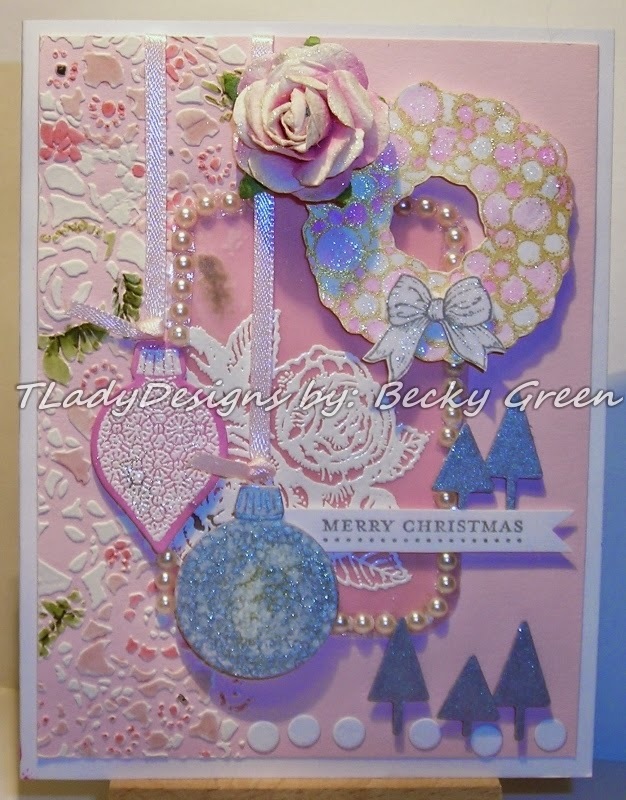 I hope you've enjoyed seeing my "Lovely Pink Christmas!" It IS FUN to mix & match what you have to get EXACTLY what you want! & join us over at Festive Friday Challenge Blog. 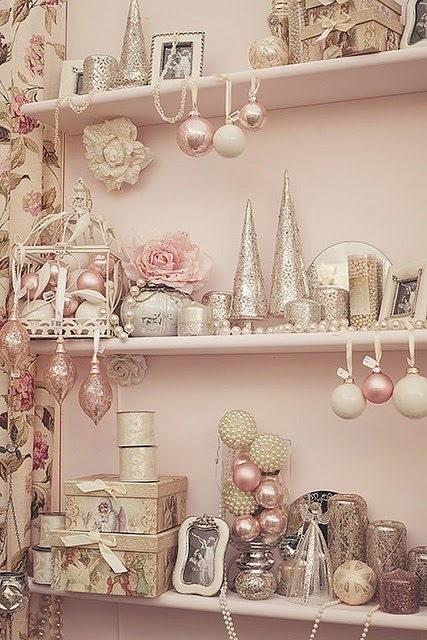 The more I do Pink for Christmas, the more I LIKE! "If that is the case, our God whom we serve is able to deliver us from the burning fiery furnace, & He will deliver us from your hand, O king. But, if not, let it be known to you, o king, that we do not serve your gods, nor will we worship the gold image which you have set up." P.S. See you next week, I have a birthday card to create! White dots from the negative space of a die. PINK for our girl & a "Ninja Mom!" Today, I do have a card that I stamped for you. Our daughter went back to school the weekend before I made this. I miss her terribly! She is always a help to me & we just enjoy chatting about things... We are so blessed with her understanding of Scripture & we enjoy our discussions. 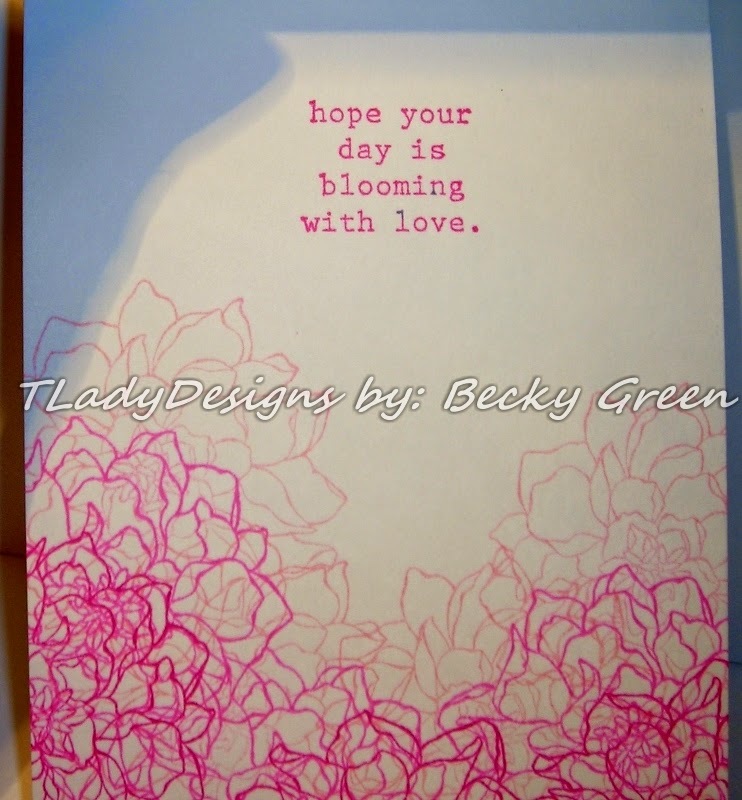 Her favorite color is PINK, so I thought she would like a Pink Card & of course it had to have flowers! 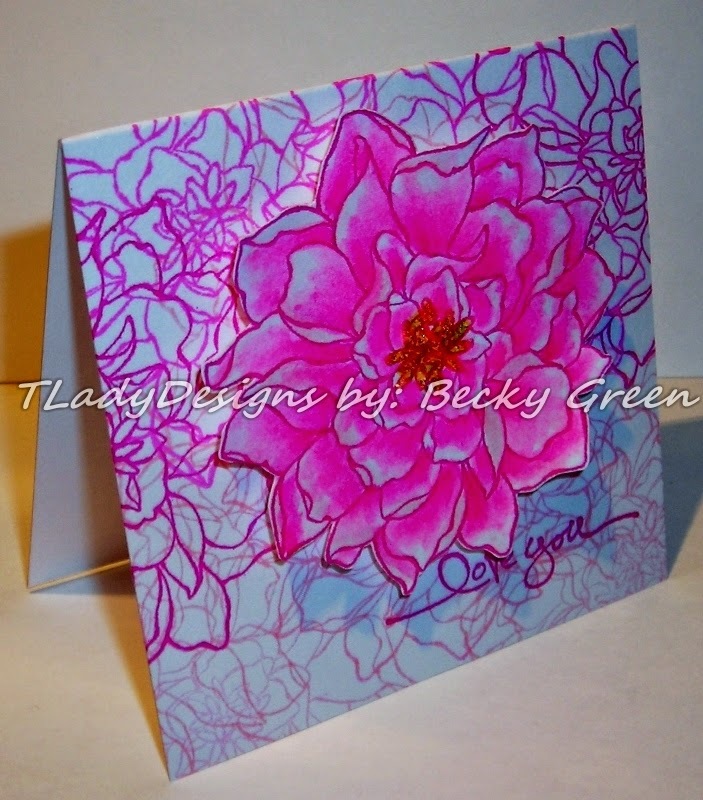 When I made this card, I was thinking just a small 3" x 3" card ( I usually choose small for quickly made cards), & that is what I made to start with. I liked how it came out & wondered how a 4 1/4" x 5 1/2" card would look, so I made one of those too! 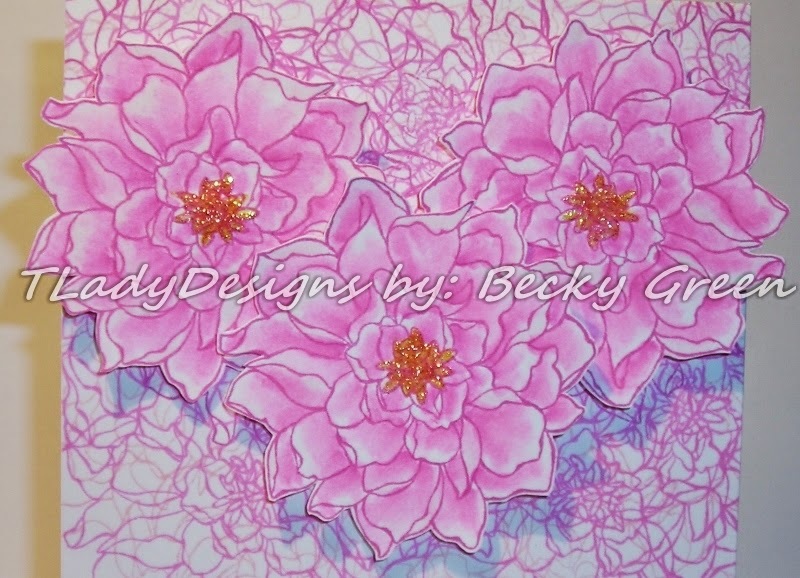 I used the set- SU- Peaceful Petals for my main image. I created an ombre affect with the colors. I wondered how this would look with an open image....just overlapping the stamped images randomly. I like how it almost looks scribbled. The little sentiment is from SU- Short & Sweet. The sentiment on the front is SU- Bloom'in Beautiful. Dimensionals were added to the back of the blooms & then arranged. 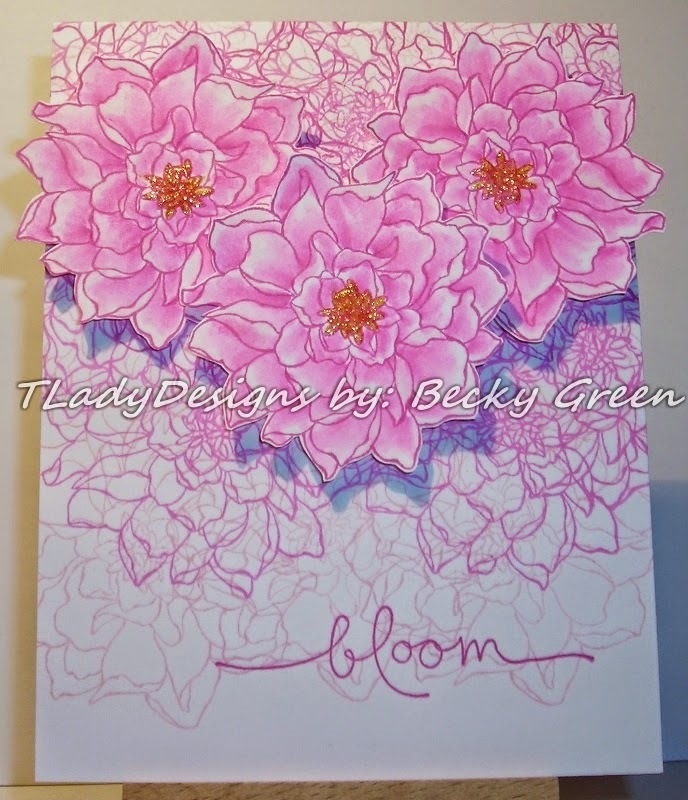 To color the blooms, I used my Letraset Water Color Marker- Blender Marker. I just touched it to my Ink Pad & picked up the color that way. For the center, I used Stickles. You can see the ombre affect a little better here. 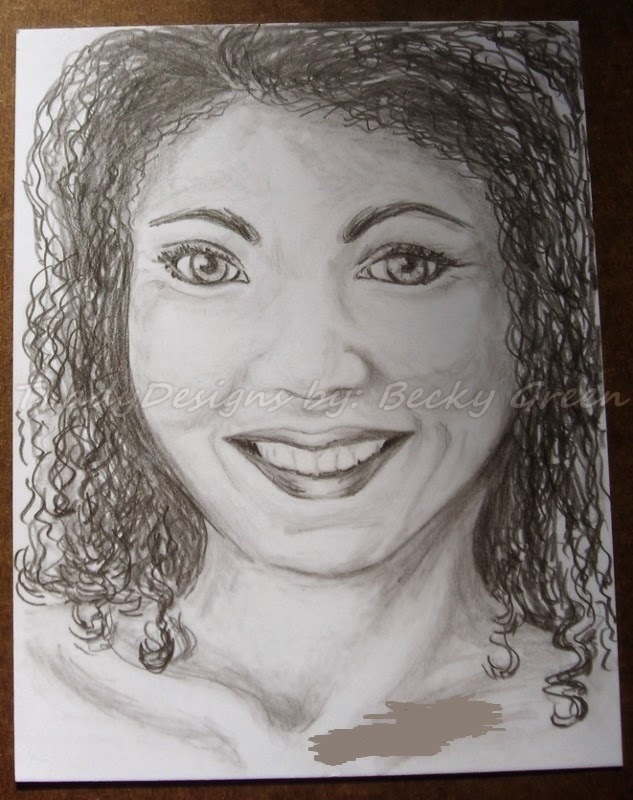 I just love the scribbled look of this, all done with an open image! The sentiment inside is from SU- Bloom'in with Love. 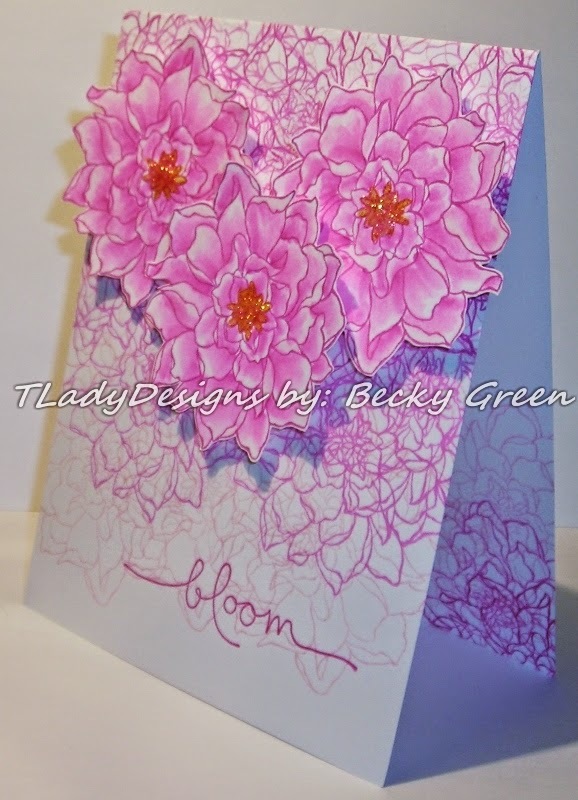 Which one do you like best, the small 3" x 3" card or the larger 4 1/4" x 5 1/2" card? I made a matching envelope, so when our daughter receives this in the mail, she'd know it is special! ***Next week I have an "announcement" in regards to my blog & what is in store...."
I'm glad you came by to see what I have for you today! 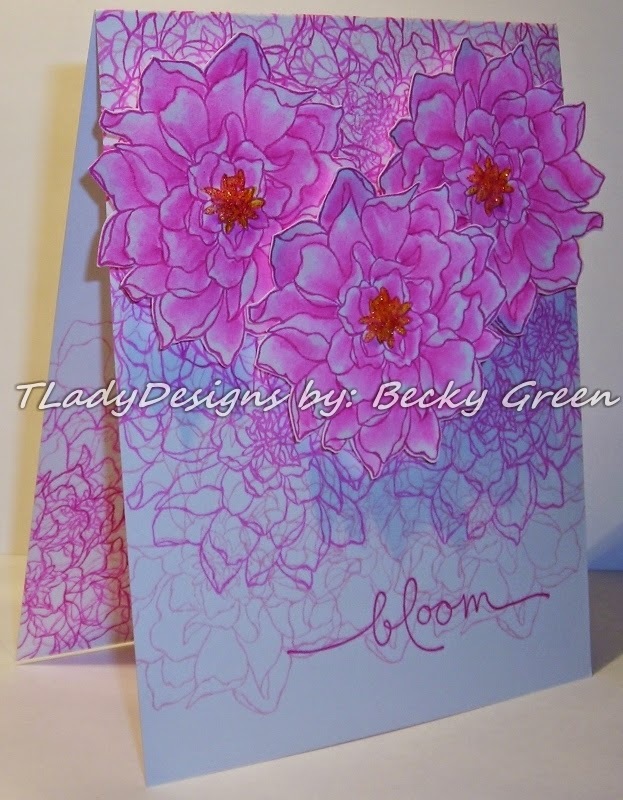 I have a card for you that I was very happy to create! Not really thinking of anyone in-particular when I made it. I just wanted to use my ability to create a card that you might like. "Your eye is a lamp that provides light for your body. When your eye is good, your whole body is filled with light. But, when your eye is bad, your whole body is filled with darkness. And if the light you think you have is actually darkness, how deep that darkness is!" & this scripture came to mind. The only thing I might expound further on with this Scripture is when first I read this, my thought was, about the light that might be in you when Christ is living in your body- when you know Him, it will show through your eyes, your life.... But, when I read this Scripture another day & thinking on it, my thought also went to what are you filling your body with now or at any given time, through your eyes? If your "eye is a lamp," helping you to see... Your eyes are meant to bring light into your body---looking on things that are good. Another words, if you look at darkness, using your eye to look at bad things/ungodly things, your body will be filled with darkness, the very darkness you are looking at, this shows the condition of your heart--that it is bad/not of God; if you look at good things/ godly things, your body will be filled with light, again showing the condition of one's heart, that it is good. Just like Paul, when he thought he was doing right by persecuting Christians, he was in the dark, & "how deep that darkness was." He was in the dark spiritually & then, God blinded Paul, & when he was visited by Ananias the scales fell from his eyes & his eyesight was restored. It also tells me God wanted Paul to see just how blind he was---a literal, physical lesson for him! This reminds me of the children's song, "Oh be careful little eyes what you see...." (I know, I've mentioned this song before. I can't seem to get away from this song when I think about growing in Christ--a constant goal. So simple, but so true!) Those lessons we learn as children ARE important! to our children from a young age! This is a very basic Christian lesson! If we teach our children these lessons, it will save them & ourselves much heartache! 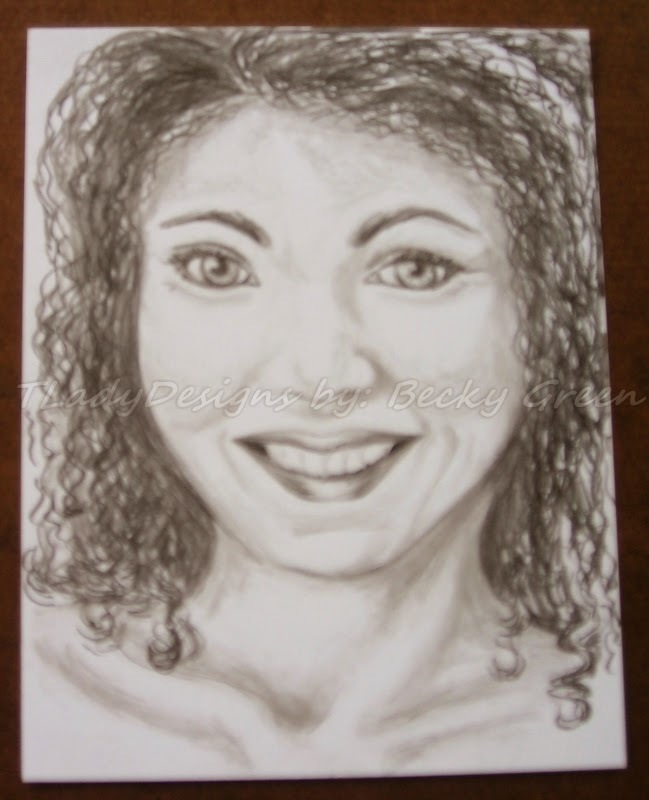 Now, to my card---- I have pictures of the progression of my image for you. 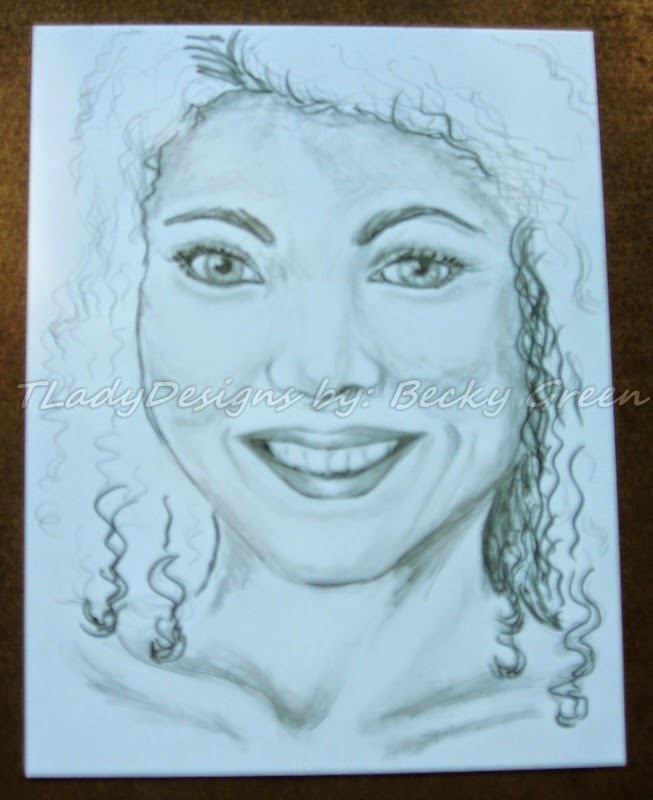 I do hope you enjoy & gain a new perspective on the beauty of a face filled with "light!" 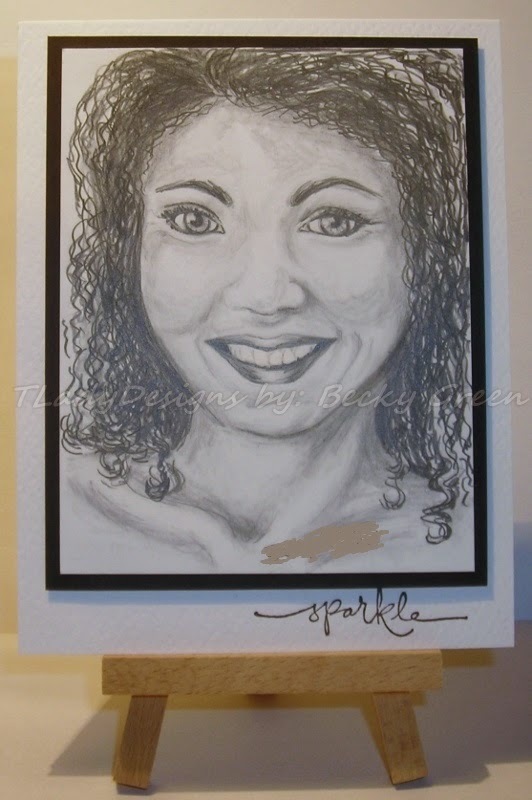 This is my image mounted on card stock. The inside is left plain for a lengthy hand written note. 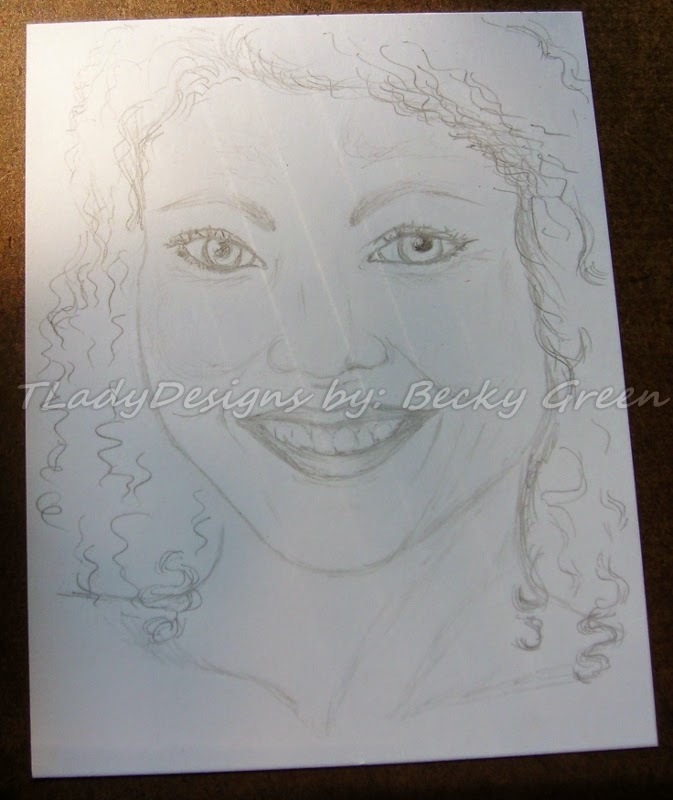 Hope you have enjoyed seeing the progression of my sketch & the finale! 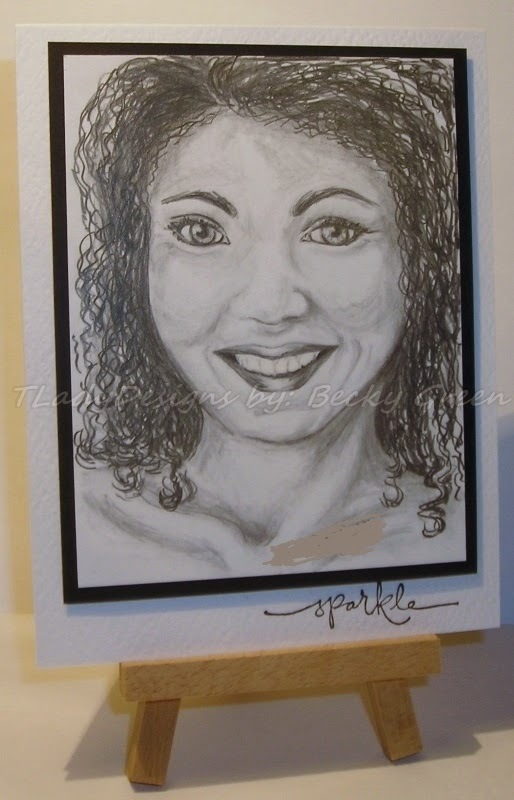 Don't forget to "Sparkle" for Christ! ***Be back next week for "PINK for our girl & 'Ninja Mom!' "